Our Hawaii honeymoon guide gives the top 5 reasons why newlywed couples should travel to the tropical & romantic destination of Hawaii. When Love & Lavender thinks about Hawaii, one of the first words that comes to our minds: romance! Hawaii is a unique destination in this world that attracts many tourists for special events like weddings, honeymoons, and anniversaries. Its no coincidence either. From the moment you step off the plane and inhale the smell of sweet plumeria, your senses come alive and you realize why Hawaii is called a true tropical romance destination. … everyday in Hawaii is one to remember. It’s not only in the movies, it’s the real deal. The rich Polynesian culture has an Aloha (caring, sharing, and giving) spirit no matter where your adventures take you around the islands. The six main islands each have a distinct personality and look; your hardest decision will be picking the best island for you. Sports enthusiast couples will love the world class golf courses, diving, snorkeling, surfing and other endless activities to fill your days. Or, just sit by the ocean and let the world go by in the warm sun — there are plenty of intimate hideaways too! Soft ukulele music and breaking surf provides a perfect romantic mood while dining over outstanding local cuisine options. A Hawaii honeymoon is always a great choice. Take part in a hula or surfing lesson and impress your friends and family when you get home! Take a Koloa run factory tour on the island of Kauai – free samples! Hawaii is one of the top honeymoon destinations in the world, and one of the most romantic places in the United States. Raw natural beauty is at its best in this part of the world. From world class underwater coral floors to the unspoiled forests covering the island, exploring Hawaii’s magnificent natural surroundings is something that must be seen. Sharing a sunset with your new spouse is probably one of the most romantic things on a Hawaii itinerary. Of course, sharing a champagne picnic at the same time would substantially increase the romance factor! 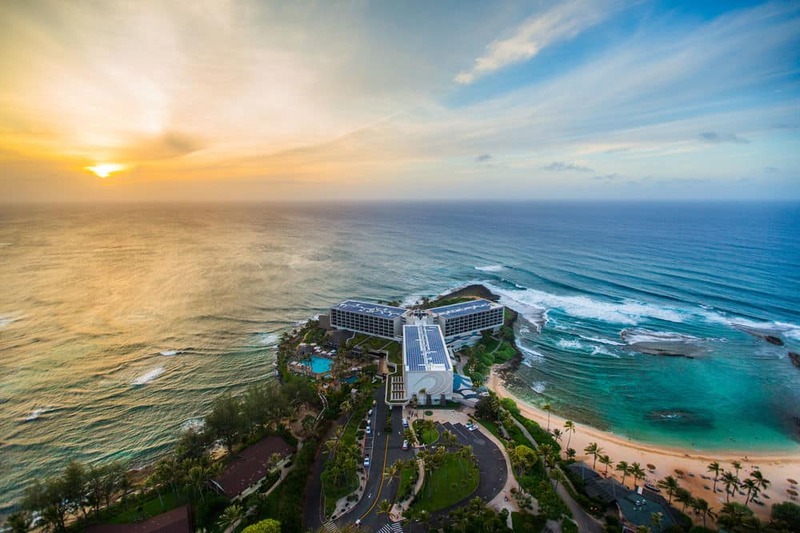 Sunsets and sunrises in Hawaii are truly something else – nothing except Pacific coastline and an unobstructed view. Get ready for rich colors of purple, pink and red like you have never seen before. World-class beaches, accommodation, food and service await. A trip to Hawaii is simply unforgettable. And, unlike other beaches or trails around the world, you can find a secluded beach or hiking trail to enjoy all to yourselves. WHICH ISLAND IS RIGHT FOR YOUR HAWAIIAN HONEYMOON? There are so many beautiful places in visit on all the different islands that make up Hawaii. Below are honeymoon hot spots most couples dream about. As the second largest island of all the Hawaiian islands, Maui is a world-renown haven for snorkelers, golfers, and sailors. It is consistently voted one of the top honeymoon destination in the US by travel publications. 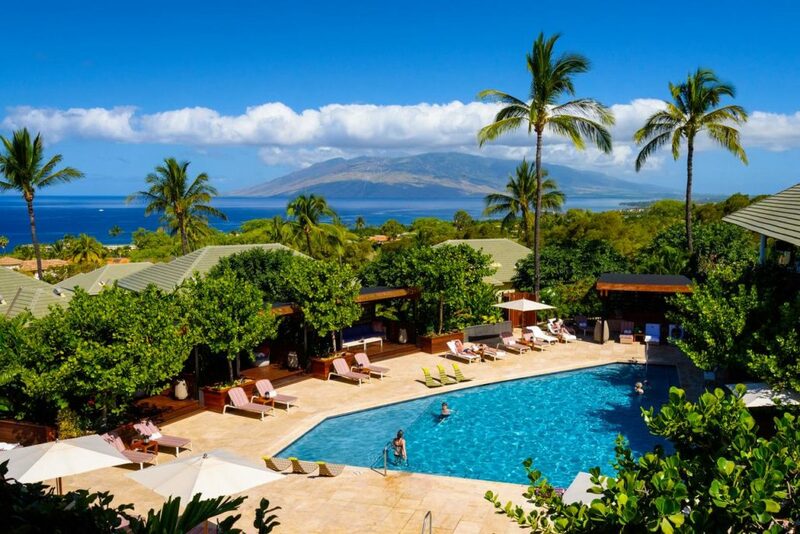 Maui offers a variety of accommodations, everything from world class uber luxury resorts to cozy self-catering beach side rentals. 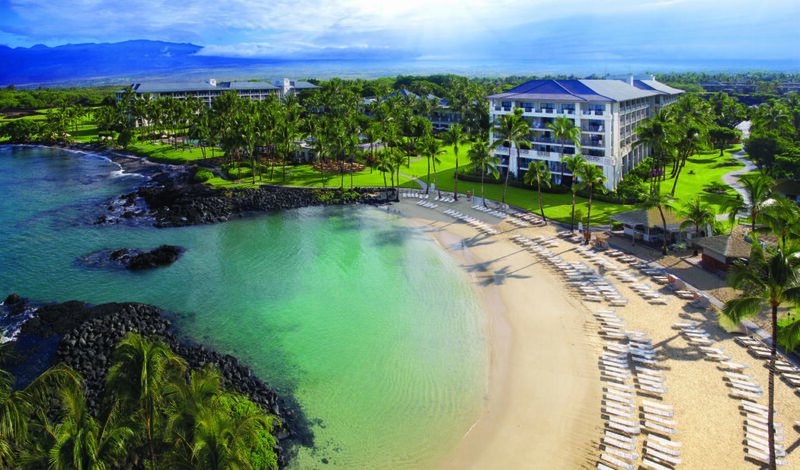 Maui is the perfect honeymoon spot for couples looking for a little rest and relaxation with many adventurous options. Known as the “Garden Isle” due to its lush green vegetation, postcard worthy beaches, and waterfalls galore, Kauai offers a laid back and relaxed atmosphere. It also offers a staggering list of non stop activities ideal for adventure enthusiast honeymooners. The island is big enough to offer plenty of activities during your stay, but small enough that it doesn’t feel overwhelming. You can take a scenic drive of the island starting at one end and be on the other side in under two hours. If it is your dream to take an amazing helicopter ride in Hawaii, this this is the place to do it! Remember those scene’s from the original Jurassic Park movie? Yep, that’s Kauai. A lot of the interior is inaccessible, but with a helicopter tour you’ll be able to really see the island’s majestic untouched beauty. 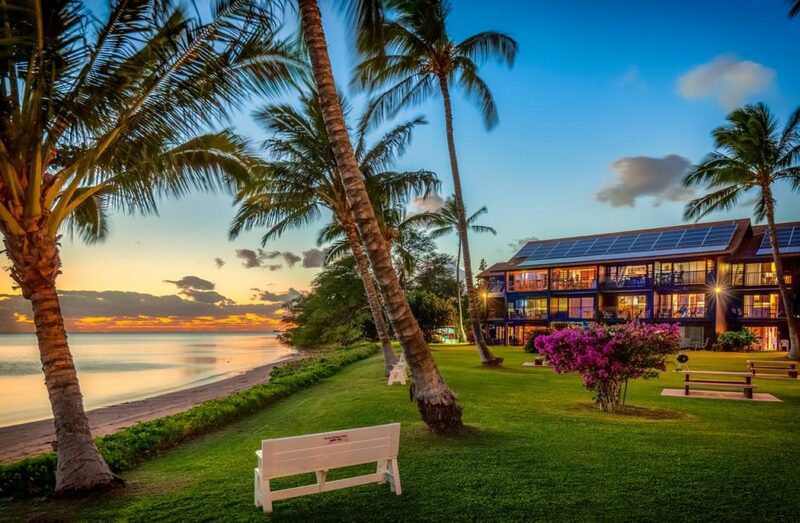 Whether you want share an unforgettable adventure together as newlyweds or just hide away at a luxurious resort, taking time to relax and the spa and treating yourself to their fine dining, Kauai will be a honeymoon you most certainly will remember. Plan a leisurely day trip to the Northshore to visit the waterfalls, lighthouse, etc. Also known as the Big Island, the island of Hawaii, is the largest by land mass in all the chain of islands and shares its name with the entire state. It has both dry desert climate in Kona on the west coast, and lush green in Hilo on the east coast, with tons of scenic sites in between. It offers the most diverse adventures of all the islands, with an active volcano at your door step, a dormant snow-capped one you can climb, botanical gardens, waterfalls and much much more. This island is for adventure seeker at heart and honeymooners looking for an action packed memorable time. For luxury honeymooners, the Hawaiian island of Lanai offers acres of unspoiled natural beauty, little crowds, tranquillity and isolation. With a barefoot atmosphere and only a handful of resorts on offer, this small hideaway creates the perfect getaway spot for couples who wan to sink into newlywed bliss. Sunset cruise along Lanai’s coastline. Book a table for two under the stars at The Four Seasons which overlooks Hulopoe Bay. Enjoy a personalized five-course menu and wine pairings prepared just for you by their expert Chef. 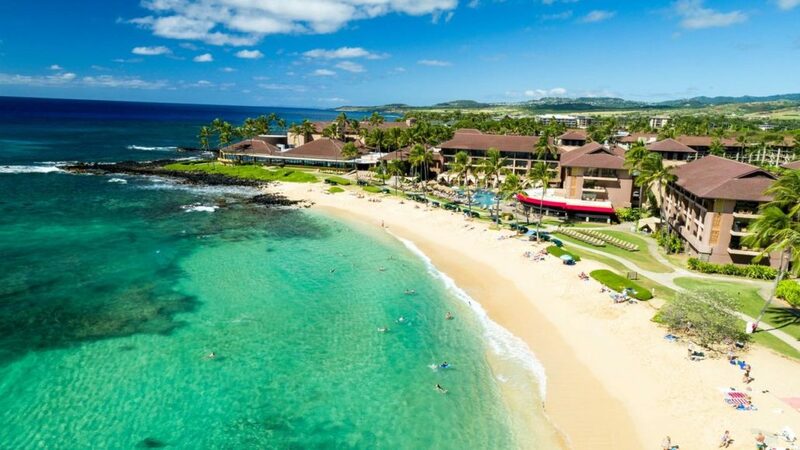 For those honeymooners who don’t have the budget for Lanai, but still want that unspoiled Hawaiian beauty, we recommend the fifth largest Hawaiian island, Molokai. This is an island for a couple seeking a quiet escape away from traffic lights, crowds, tall buildings, and night life. A place that offers stunning views, rest and relaxation after a long wedding planning journey. A place where Ancient Hawaii traditions can still be seen; like the hula dance which was created here. Take a dip in the water. There is a reef that lies about a mile off Molokai’s south shore, which makes the water relatively calm and shallow. If you only have time to visit one Hawaiian island, may we suggest choosing the third largest island of Oahu. It is by far the most popular choice for tourists, and for good reason. Oahu is Hawaii’s central flight hub for any incoming flights from the mainland, the vast majority of Hawaii’s population resides on Oahu and it also hold the capitol of the state, Honolulu. This all means that tourists have access to all the modern conveniences afforded by a city. The only possible downside to Oahu is that as it is a so packed with tourists. Also, finding a romantic hotel may be more of a challenge. Honolulu, is located on the island of Oahu, and is known to be one of the most visited of all the Hawiian Islands. Honeymooning in Honolulu offers the best of both worlds because couples have access to the modern conveniences of a capitol city like museums, shopping, fine dining, and nightlife, but also have the chance to experience beautiful Hawaiian landscape and traditions. If you are a couple who likes to be beach bums and adventure junkies during the day and live it up in the city at night, Honolulu is probably the perfect spot for you! 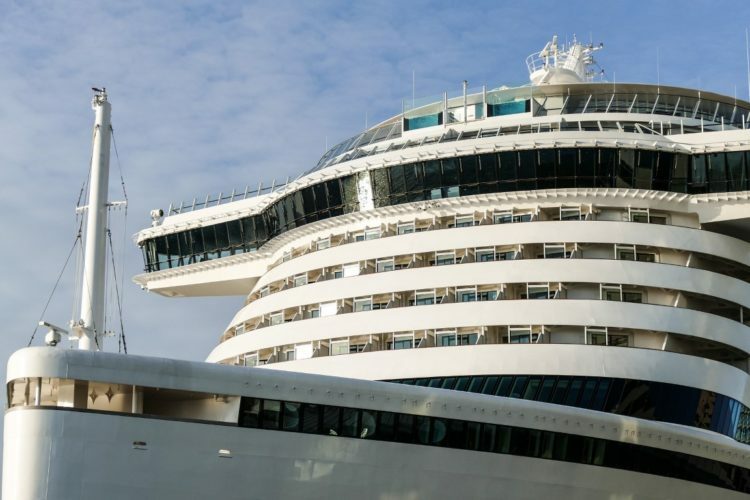 A honeymoon cruise around hawaii hitting up places like Hilo, Honolulu, Kauai, Maui (lahaina), is a great way to see a good chunk of what Hawaii has to offer. 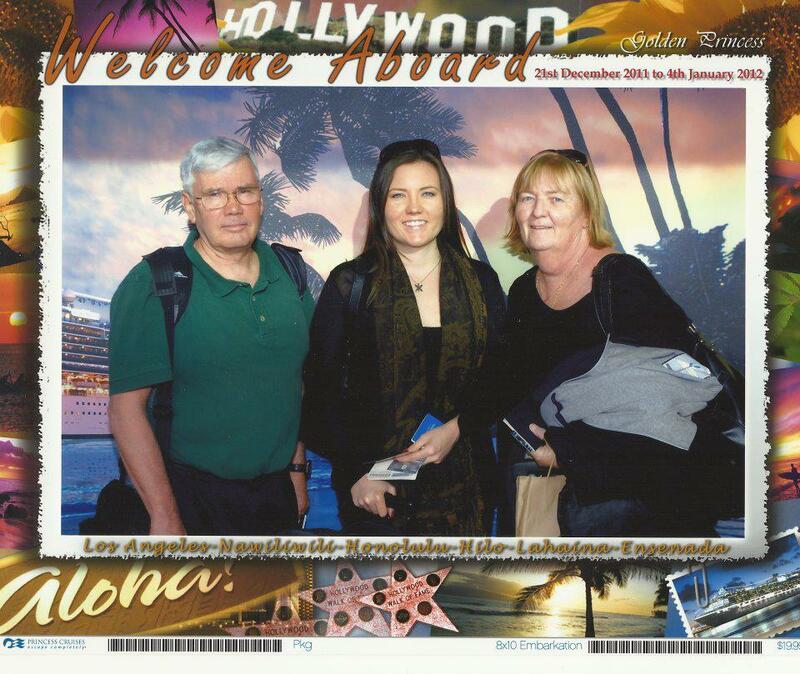 Meredith did a Christmas/New Years cruise abroad Golden Princess from LA to Hawaii back in 2011 and had the most wonderful trip. She highly suggests this route if you are thinking of visiting Hawaii. Bargains can be found mid-April through to early June, as well as early September until Mid-November. Keep in mind though that some activities are seasonal – whale watching is a good example as it only takes place in the winter. If you are looking to surf, the water can get rough and you may find that some beaches are closed due to unsafe conditions. 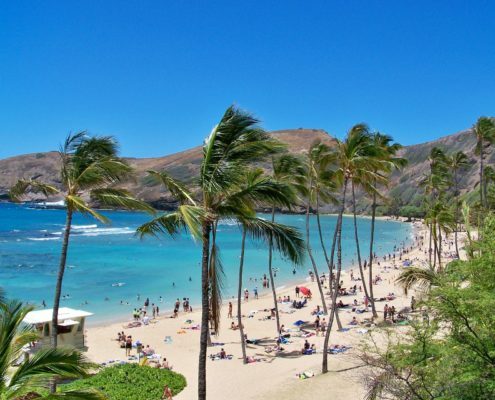 The average year-round temperature in Hawaii is 80°F, which is a perfect temperature in our opinion. Rainy season runs November to March, while the dry season is typically April through October. Car Rental – Spend time relaxing on the beach or laying in the sun on your honeymoon should be the primary goal of your trip. However, we think you’ll miss out on a lot more if you don’t get off the resort and explore by car (preferably a red mustang convertible). Regardless of what island you vacation, a car rental is a smart way to get around. Bicycle – Renting a bike to see the landscape at a slower pace is another great way to spend your day. Andrew fondly remembers a family trip he took in 2008 to Oahu’s North Shore and how much fun it was to cycle on the open road. Towering mountains on one side and stunning coastline on the other. Public Transportation – If you don’t fancy renting a car, you might consider going to Oahu. Oahu has Hawaii’s best public transportation of all the islands. The Bus allows you to get around the island easily and cheaply. You may want to plan your honeymoon during one of the many special events happening on one of the Hawaiian island. Check out Go Hawaii’s event calendar for more details. The translation of ‘Aloha’ to English means hello, goodbye, peace and love! Use the word often to get a great feel for a warm Hawaiian way of life. 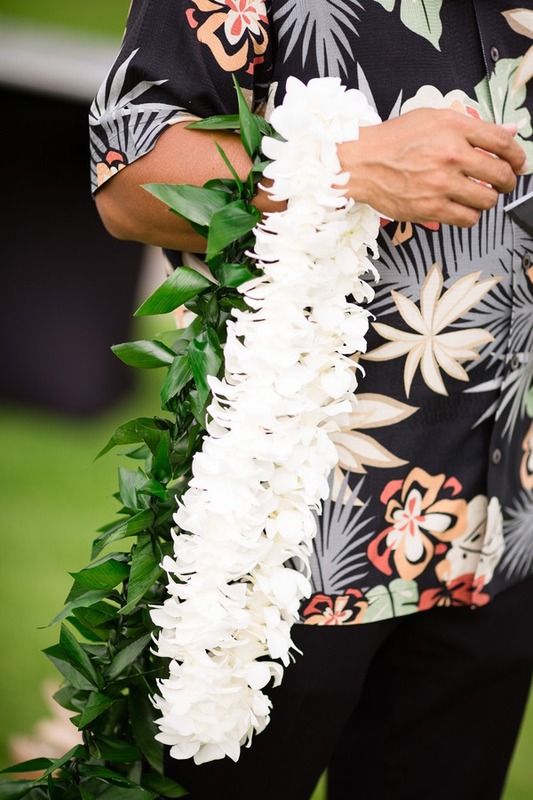 The second you get off the airplane, grab a beautiful lei greeting for you and your partner in order to set the mood. Language: English; greetings in the Hawaiian language are common! Driving: Just like in mainland US, Hawaiians drive on the right hand side of the road and speed limits are expressed in miles per hour. Well, there you have it. I hope you have found our honeymoon guide to Hawaii helpful. 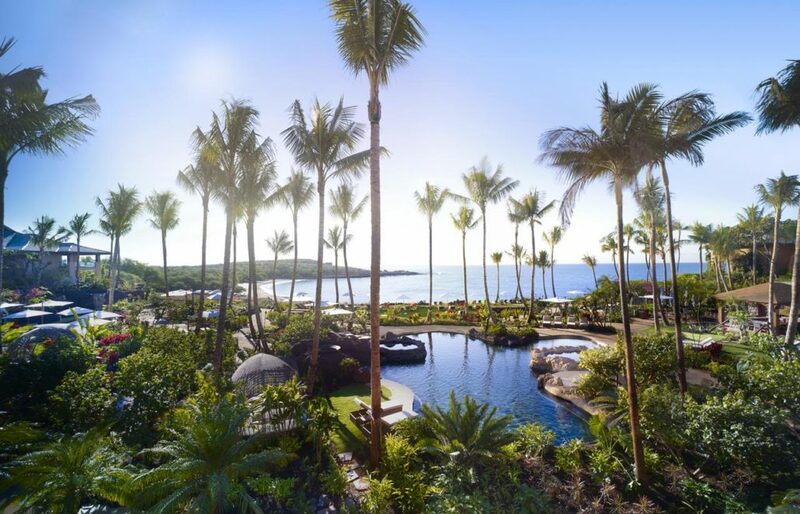 If Hawaii isn’t the honeymoon spot for you and you want to see other honeymoon destination options then head over to our Honeymoon Destination Travel Guide section.